Topological Groups. Topological Groups. Subgroups. Quotient Groups. Complete Groups. The Bilateral Completion of a Haussdorf Group. Metrizable Groups. Metric Topologies on Groups. Closed Graph and Open Mapping Theorems. Locally Compact Topologies on Groups. Summability. Topological Rings and Modules. Topological Rings. Topological Modules. Completions of Topological Rings and Modules. Continuity of Inversion. Locally Bounded Modules. Normed and Locally Bounded Rings. Normable Rings. Absolute Values. Values. Topologies Definable by Absolute Values. Valuations. Discrete Valuations. An Introduction to Nonarchimedean Analysis. Topological Vector Spaces and Their Applications. Topological Vector Spaces over Valued Division Rings. Finite-Dimensional Vector Spaces. Principles of Functional Analysis. Extensions of Absolute Values. Locally Compact Division Rings. Valuations. Approximation Theorems. Extensions of Valuations. Valuations on Algebraic Extensions. Maximal Valuations and Linear Compactness. Henselian Valuations. Locally Bounded Topologies. Locally Bounded Topologies on the Rational Field. Dedekind Domains. Linear Topologies on the Quotient Field of a Dedekind Domain. Locally Bounded Topologies on Algebraic Number Fields and Algebraic Function Fields. Locally Bounded Topologies on Orders of Algebraic Number Fields and Algebraic Function Fields. Historical Notes. The Origin of the Theory of Topological Fields. Absolute Values. Valuation Theory. Topological Vector Spaces. Topological Groups. Norms. Locally Bounded Topologies. Bibliography. Indices. 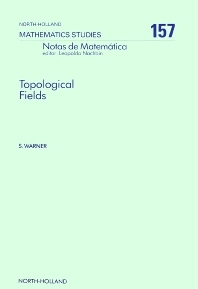 Aimed at those acquainted with basic point-set topology and algebra, this text goes up to the frontiers of current research in topological fields (more precisely, topological rings that algebraically are fields). The reader is given enough background to tackle the current literature without undue additional preparation. Many results not in the text (and many illustrations by example of theorems in the text) are included among the exercises. Sufficient hints for the solution of the exercises are offered so that solving them does not become a major research effort for the reader. A comprehensive bibliography completes the volume. Detailed description of topological structures on rings and fields.